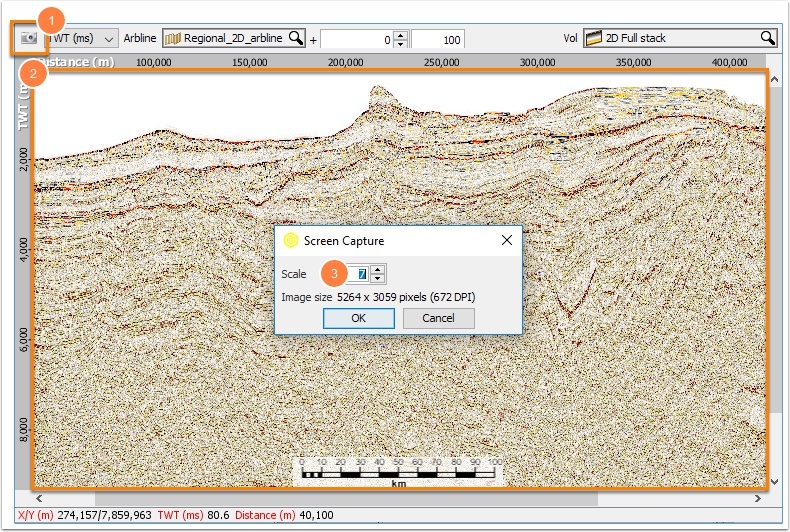 In this example, we’ll save a 400 km 2D seismic section at a seven times display resolution, giving an output image 5264 pixels wide - detailed enough for almost any purpose. Click the Camera icon at the top left of the window. This starts the capture selection mode. a. Move the mouse cursor over the area to capture. b. A highlighted region follows the mouse pointer. c. Press space-bar (or right-click) as many times as you need to increase the capture area. d. Move the mouse again to reset the capture area. e. When you left-click, the highlighted region will be captured. After clicking, the Screen Capture window appears. Increase the scale to 7x and click OK. If you’re working on a presentation in another program, hold down CTRL when clicking the Camera icon. Instead of saving to a file, the capture goes straight onto the clipboard. It’s perfect for pasting straight into a document!